01 Arrive Delhi: You will be met on arrival at the International airport. Transfer to your hotel. 02 Delhi: Breakfast at hotel. Full day tour of Old & New Delhi.Enjoy the DANCES OF INDIA SHOW in the evening and retire early. Overnight at Delhi . 03 Delhi - Jaipur: Breakfast will be at the hotel. Drive to Jaipur. Reach Jaipur and check in at hotel. Afternoon sight-seeing tour of Jaipur visiting. Proceed for dinner at a VILLAGE THEME RESTAURANT. Overnight will be at Jaipur. 04 Jaipur - Agra: Breakfast will be at the hotel. Morning excursion will be taken to the Amber Fort. Climb the FORT on elephant back in royal style. Continue your drive to Agra and on arrival check-in at Hotel. Overnight will be at Agra . 05 Agra: Breakfast will be at the hotel. 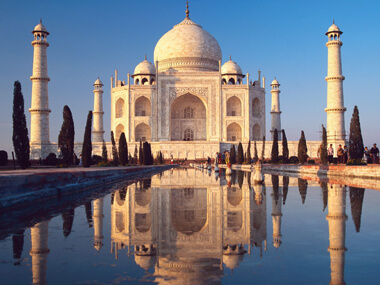 Proceed for the sight-seeing of Agra . Overnight will be at Agra. 06 Agra - Jhansi - Khajuraho: Breakfast at hotel. Transfer to station for train to Jhansi . Reach Jhansi and transfer to Orchha, 12 km away. Reach Khajuraho. Transferred to hotel and relax. Evening free. Can go out for a stroll. Overnight will be at Khajuraho. 07 Khajuraho - Varanasi: Breakfast at hotel. Proceed for a guided tour of the exotic temples of Khajuraho. Transfer in time to airport for flight to Varanasi . Upon arrival at Varanasi , you will be met and transferred to hotel. Overnight at Varanasi . 08 Varanasi: Back to onward destination.